Research evidence has shown that there can be no magic formula or set of ‘off the shelf' prescriptions that can be applied in securing employee commitment and involvement towards the organizational goals. Still organizations are trying one or another formula and investing to create a culture of harmony, wellbeing and a productive environment. It has been proved that psychological wellbeing of employees is directly proportional to positive work culture and growth. Positive Psychology focus on wellbeing, satisfaction, hope, optimism, flow and happiness. Its focus is building positive qualities in life and work rather than repairing negative aspects. One of these attributes is Employee Engagement. CSR is an emerging field which has garnered increased attention in recent years; a development which displays a changing mindset about the role and responsibilities of the businessmen and employees toward the society. 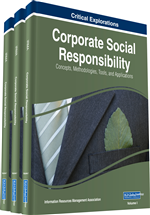 This paper discusses and proposes a model that positive perception of employees about the CSR initiatives enhances the engagement level of employees. ‘Employee Engagement’ is the recent concept given by Kahn in 1990 and is one among the hot topic of discussion among the researchers and practitioners. Employees’ Engagement refers to how employees behaviorally apply themselves physically, cognitively and emotionally during role performances (Kahn, 1990). To be physically engaged, employees devote their physical and mental energies and resources wholly into their role performance (Khan, 1090). The Corporate Leadership Council's model of engagement refers to these components as emotional and rational commitment. This results in increased discretionary effort, willingness to go “above and beyond” their routine job and intent to stay with the organization. There is now a growing consensus amongst practitioners in the field and academics that engagement is a complex ongoing process which is influenced by and can influence many organizational and job factors (Saks, 2006). Researchers have explored and are exploring different antecedents and consequences of employee engagement. But it is evident that employee engagement is an important business driver. As cited by J. Bhatnagar and Soumendu Biswas, more recently employee engagement has been related to building a firms’ competitive advantage. Employee engagement in fact can make or break the business bottom line (Lockwood 2006), Martel (2003:30, 42) is of the opinion that in order to obtain high performance in post-industrial, intangible work that demands innovation, flexibility, and speed, employers need to engage their employees. They say that objectives are more easily met when employee are engaged are more likely to fall short when they are not. They further said that in a study they proposed linkage between firm performance and employee engagement, but in a reverse feedback loop. This entails that those firms which are finically robust will have a higher employee engagement score. Employee engagement has been identified as an important business driver that has the capability to impact an organization's overall success. Engagement has the potential to significantly affect employee retention, productivity and loyalty (Corporate Executive Board, 2004). It also has a link to other organizational factors such as customer satisfaction and company reputation (Lockwood, 2008). There are many potential reasons for engaging employees, some include: enhance customer service, increase customer satisfaction, improve organizational productivity, improve the bottom line, positively affect, teamwork and morale, align employees with strategy, reduce turnover, attract new employees, build a succession pipeline, help workers live more satisfying lives, and reduce absenteeism (Paradise, 2008, p. 55).